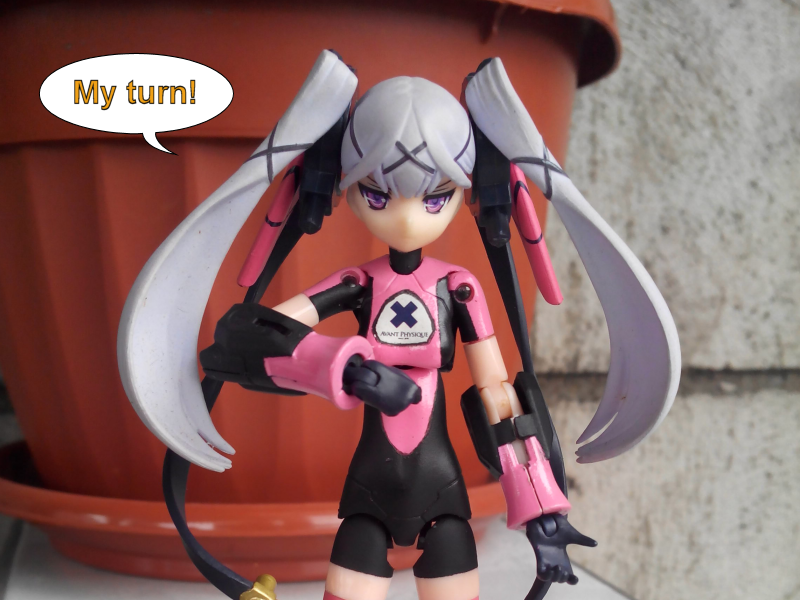 At long last, here's my long-waited Busou Shinki Custom Armors, the ZeroEdge way! And by that, I mean this is how I do it, not that I made any of it a standard or anything, especially since I do almost everything on the fly... With all my old short tutorial pics disappearing with majhost, and with some people here and on FB asking for tips, I made this guide to serve as a reference. Ok, so I don't have a dremel or pinvise. Instead, I have this set of small screwdrivers that I use to hand-drill holes into plastic parts (crude, but they work!). This is what I've been using for years, but I would HIGHLY recommend a dremel and pinvise. They would save you a lot of time, promise. Also, get a good, clean area to work in, preferably a work table of sorts... not like me, I work on my bed, since my room is tiny. What part/s of the shinki do you want to mod in extra parts or armor? The common areas are the back pack, arms/forearms, legs/lower legs, chest and head. The most common, and perhaps the easiest mod, is the backpack mod. All you have to do is pick a new backpack for your shinki, stick it into her back connector, and then you're done! Easy, right? How many sprues to use? I use 1 (the middle one) if the backpack is simple and light (i.e. 1/144 Cherudim's backpack). Use 2 or 3 of the overall weight is too much for just 1 sprue to handle. The problem with using more than 1 sprue is the placing of the holes on the backpack. If the hole placement is wrong, the sprues won't fit into the back connector (duh! ), so to avoid that, I kinda reversed the steps; I stick the sprues into the back connector first, THEN fix them into the backpack. If you don't have any of the shinki sprues left (or if you've never had them), find a suitable replacement as long as it is of the same thickness. 1. First, make holes in the backpack that you're going to stick the sprues in, but don't glue them together yet. 2. 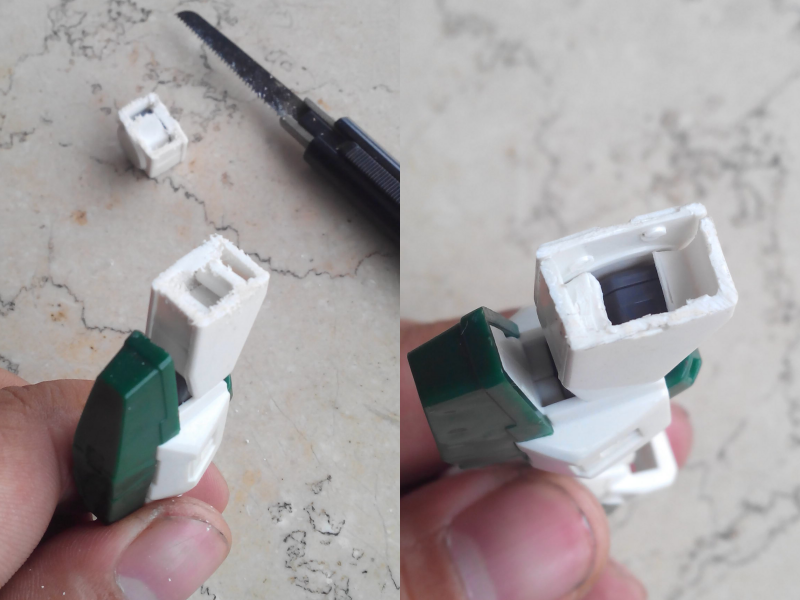 Then, cut a length of sprue (or two or three), and stick them into the back connector. 3. 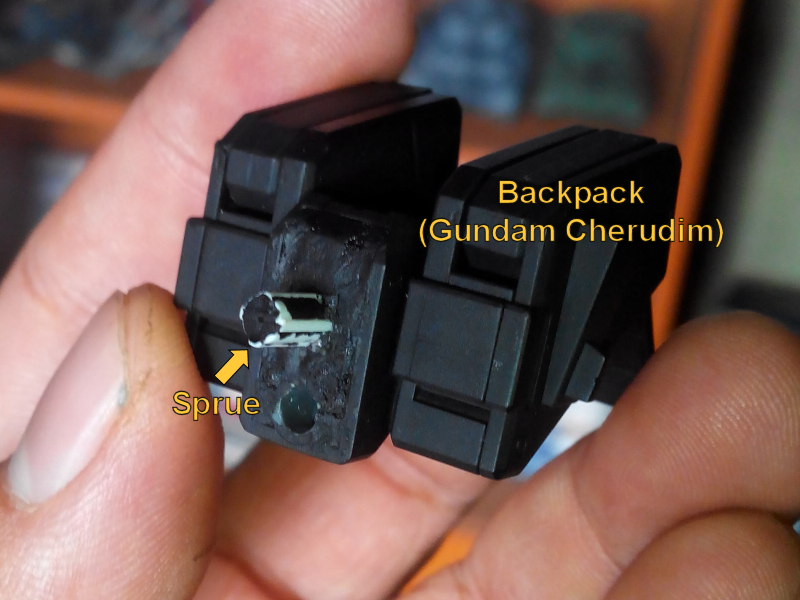 Finally, stick in the backpack and glue or use epoxy putty to fix the sprue into the inside of the backpack's hollow interior. 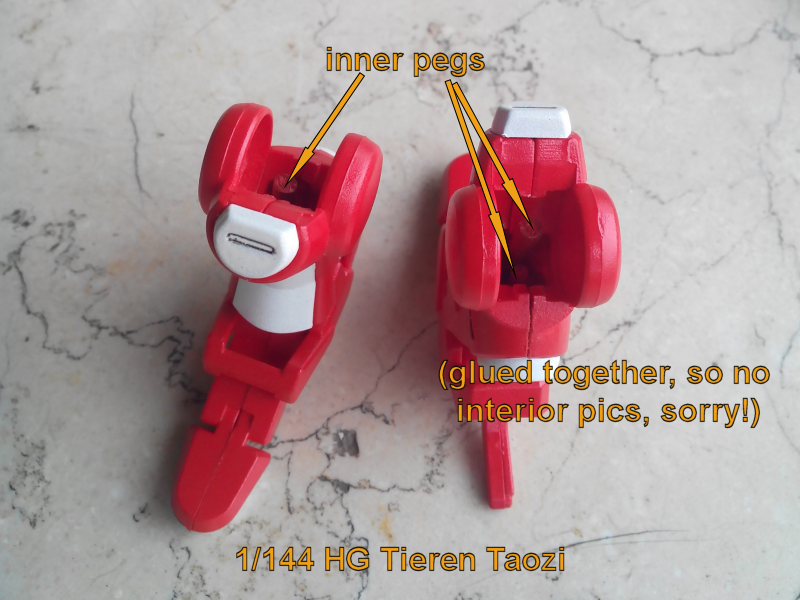 Just make sure, in case you're using super glue, to avoid gluing the surfaces of the back connector and the backpack together. Don't worry much about the putty, just make sure that the holes you drilled aren't too big. After the glue or epoxy fully dries, carefully pull out the backpack. The sprues should leave the back connector if the sprues are securely stuck in the backpack. It's easy if the backpack's surface is generally flat, but in some cases, the backpack is going to have a lot of empty space where you want the stick the sprues in. Just fill in the space with epoxy putty, then stick in the back connector and sprues combo. It's a lot messier, but nothing a little cutting and sanding can't fix. One more thing... when placing the backpack, make sure that it doesn't interfere with the other connection reserved for the action base. Naturally, big backpacks will make anything back-heavy, so retaining the good connection with the action base is important. Last edited by ZeroEdge on Mon Apr 18, 2016 5:59 am, edited 6 times in total. Up next we have custom armors for the arms. 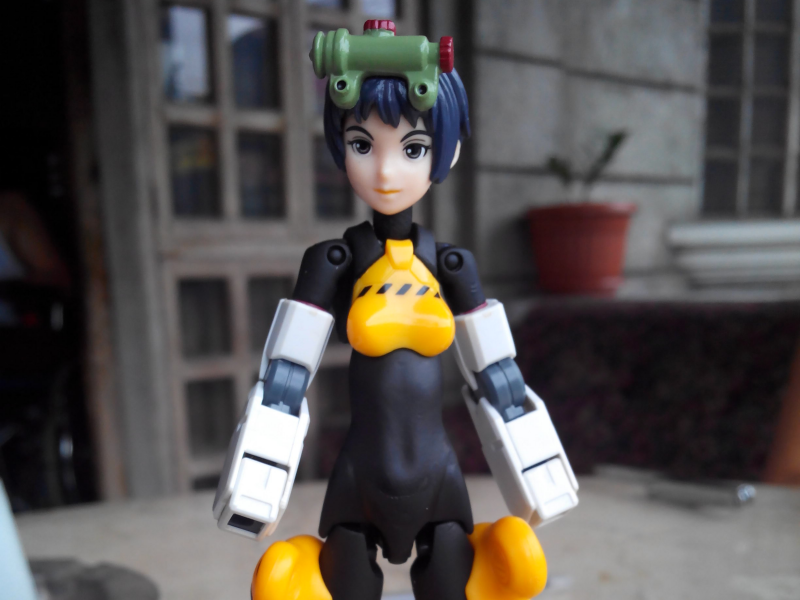 Modding difficulty will depend on which gunpla or whatever you choose to mod. I would prefer the more recent releases of gunpla that have rotating upper arm parts over the old ones which arm rotation depends on plycaps near the elbows. As for aesthetics, I prefer arms that aren't too long or too large as I want to keep the proportions just right. 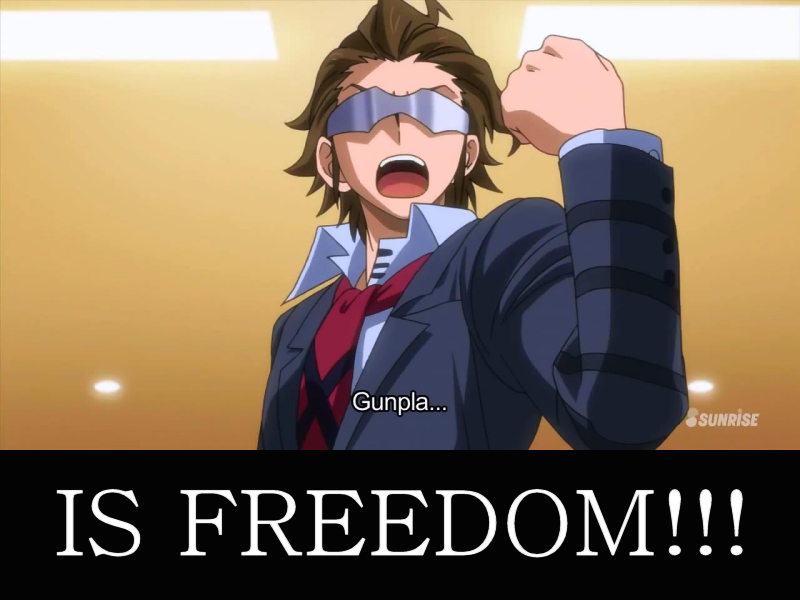 But, as Meijin Kawaguchi said, "Gunpla is freedom! ", be free to choose for yourself and don't just take my work for it. I have two styles of modding arms: the full arm and the bracer type. This is the one I use the most, that is, replacing the entire arm from the upper arm (humerus) joint. Depending on the type of arm you're going to use, there might be no need to mod at all. But according to experience, arm replacements that don't require any type of modification are very rare. 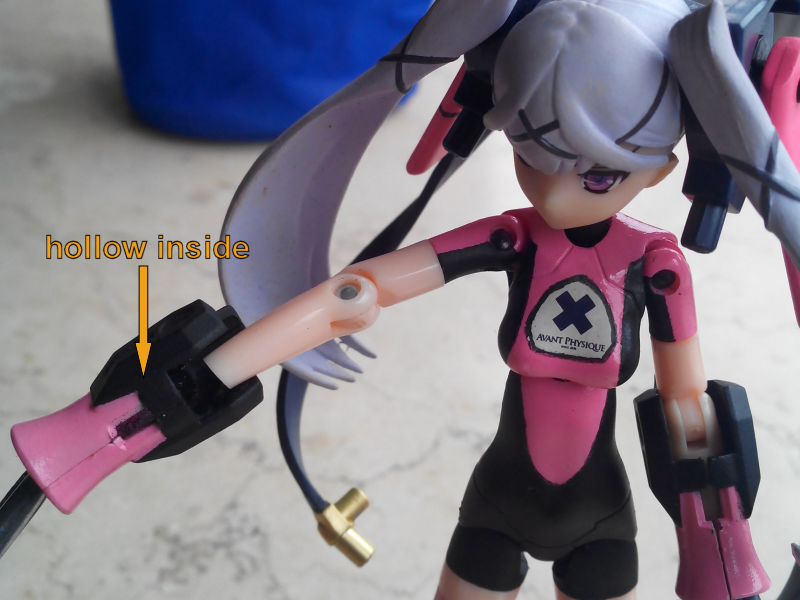 If you're lucky enough that your chosen arm joint is one with a hole or polycap that is an exact fit with the shinki's upper arm peg, then good for you. There might be sone minor adjustments like having the hole a tiny bit too small or too large, but as long as epoxy putty isn't involved, it can be easily rectified. 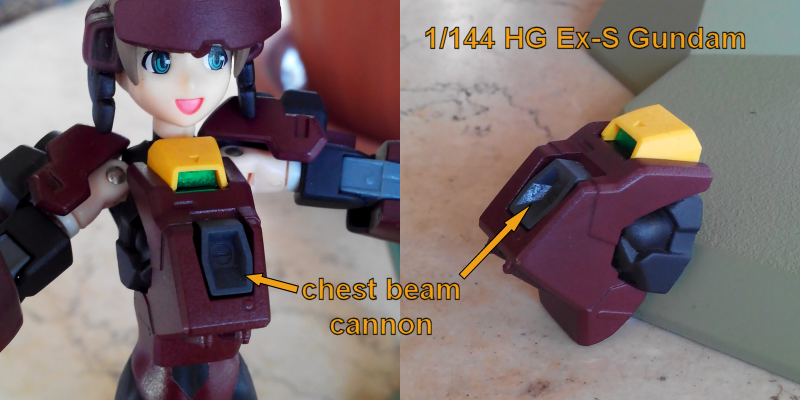 An example of a "plug-and-play" arm replacement would be using 1/144 Susanowo's and 1/144 Nadleeh's arms. 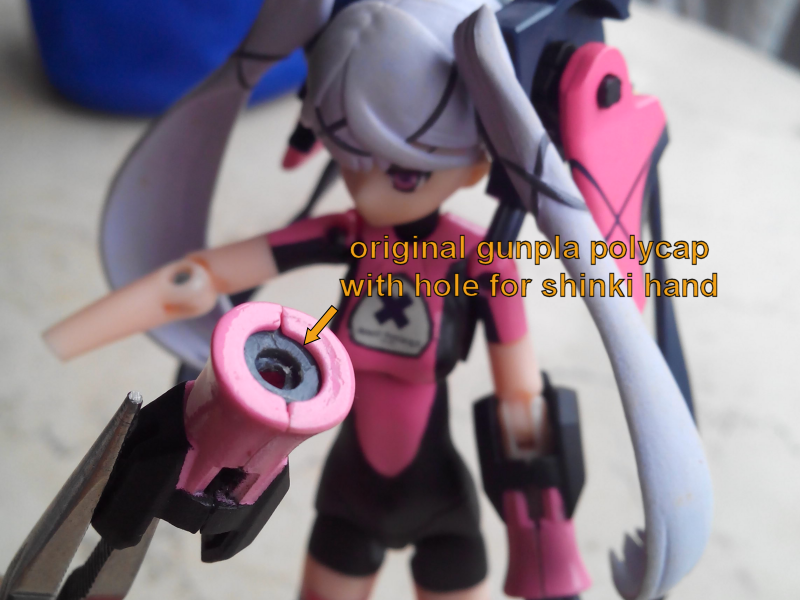 As you can see, shinki upper arm peg fits nicely into the ball-type polycap in the Susanowo's arm joint, and the hole on the inside of Nadleeh's. Just plug it it, and you're done (paint is optional, but recommended). 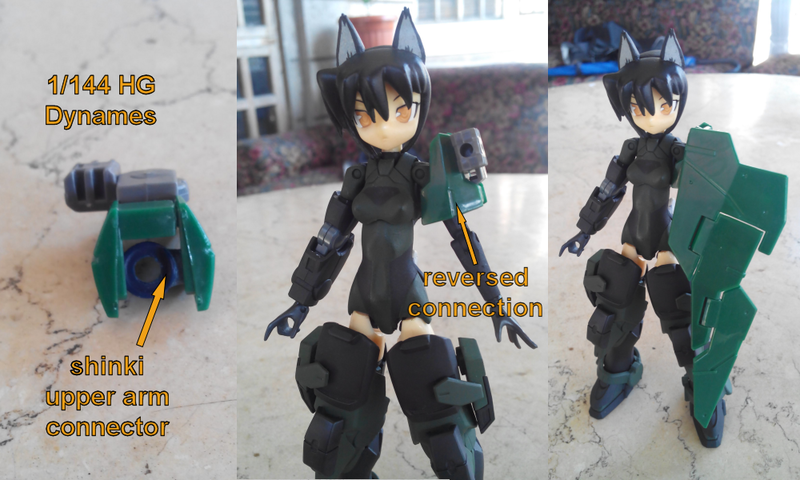 However, most of the time, moderate modding is involved when there is no existing hole for the shinki upper arm peg to connect to. 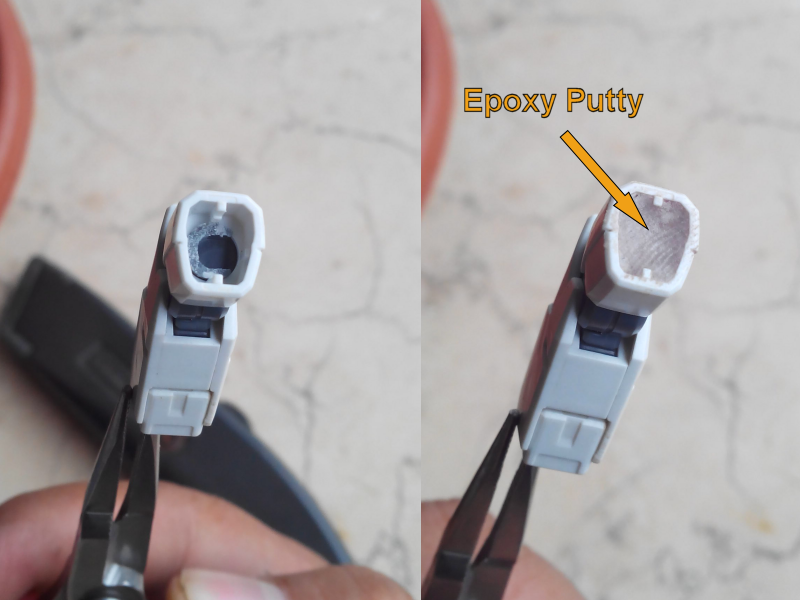 In these cases, I turn to the use of epoxy putty (the common general-purpose type that's common in hardware stores, but if you have hobby grade putty please use it by all means). The gist of it is filling up the inside of the upper arm with putty and then making a hole for the shinki to connect to. 1. Clear out the space in the upper arm. The depth of the space must be a little longer than the shinki upper arm peg. Just be careful not to remove too much that the elbow joint is affected, sometimes I had to glue the upper arm shell and the elbow part together for this to work. If the gunpla arm you chose already has enough free space, skip this step. 2. Fill in the space with epoxy putty, but not too much. 3. While the putty is still soft, coat a bit of talcum/baby powder on and around the shinki upper arm peg then carefully sink it into the putty. Make sure that everything is aligned properly. Hold for around a minute or so, then slowly pull them apart (the powder should keep the putty from sticking into the shinki peg). If done properly, there will be a correct-sized hole left in the putty. Wait for it to harden a bit more, then cut away the excess material. 4. Putty usually cures around 30min to 1 hour (with full strength at 24 hours). By then, combine the joints together. If the joint is a nice fit, rejoice! If the joint is loose, it's nothing a little super glue won't fix. Put a tiny dab of super glue on the end of a toothpick and smear it around the upper area of the hole, be careful not to let any glue into the bottom. After it fully dries, the super glue would have made the hole a tiny bit smaller and the joint will have become tighter. Just be careful not to make it too tight as you can damage the shinki peg, in which case use a bit of fine grit sandpaper or file to carefully expand the hole. Always make changes in the hole, never on the shinki peg. Be sure to let the putty fully cure before leaving the joints together for long. 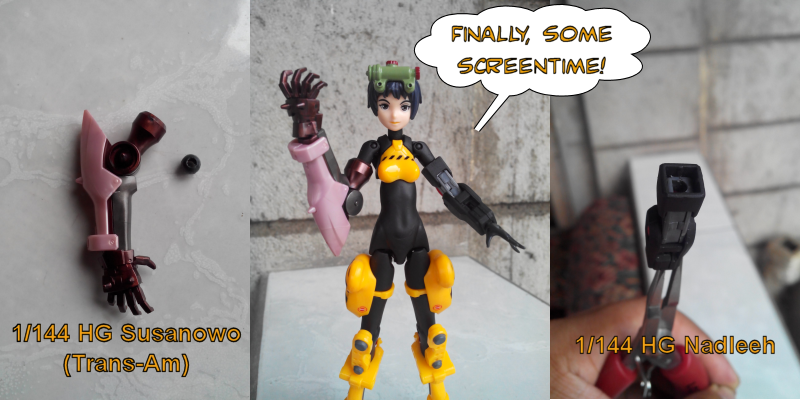 Done correctly, the joint would have almost the same feeling as that if you're using the shinki's original arm. Make sure that the arm rotates freely. A bit of patience is the key, hurry too much and you risk fusing the joints together (since epoxy and/or super glue is involved), in which case, the worst case scenario would be to destroy the arm to save the shinki peg. If this ever happened to me (thankfully it hasn't!) I would rather destroy everything to save my shinki. To add for aesthetics, use the upper arm spacer. That can make the joint look cleaner and better, but its use is up to your discretion. As for the hands, you can use whatever's already connected there. I personally don't like gunpla hands on shinkis, they look bulky and don't hold weapons and things not intended for that specific gunpla's hands. Well, shinki hands aren't that good at holding stuff either, but to me they look a heck of a lot better. To use shinki hands on your custom arm, just do the steps above except on step one because all you really have to remove is the cup-shaped polycap that the gunpla's hand attaches to. My Baby Razz, Ayu, is the only one sporting the bracer type armor. This type is armor for the forearms only, and works because Ayu has a small-type body. 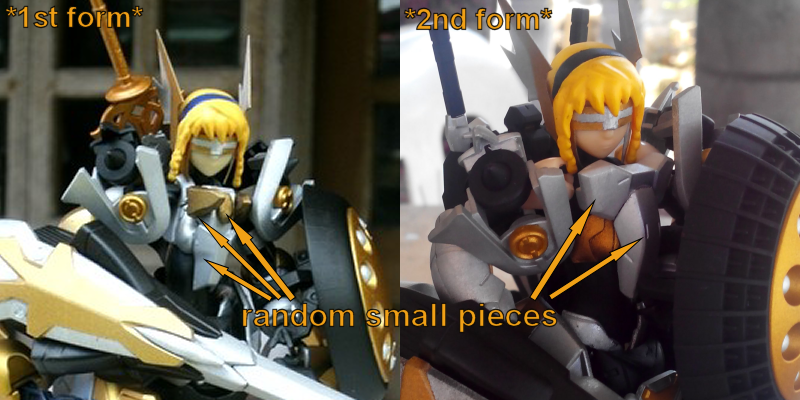 That means her arms are shorter and thinner than the standard body's, and makes it easier to get a hollowed out gunpla forearm and wear it without replacing her arm completely. 1. Choose a gunpla forearm to be modded into a bracer. Once cleared out of everything inside, it should have enough space to slide in the shinki's forearm (without the hands). 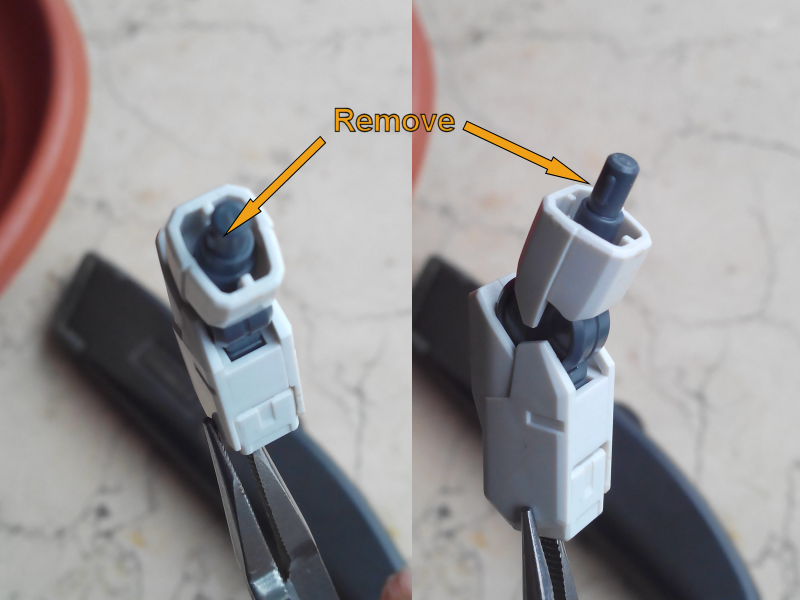 Retain the polycap that the gunpla's hand connects to. 2. Drill a hole in the very center of the hand polycap. The shinki hand should fit snugly into the hole. 3. 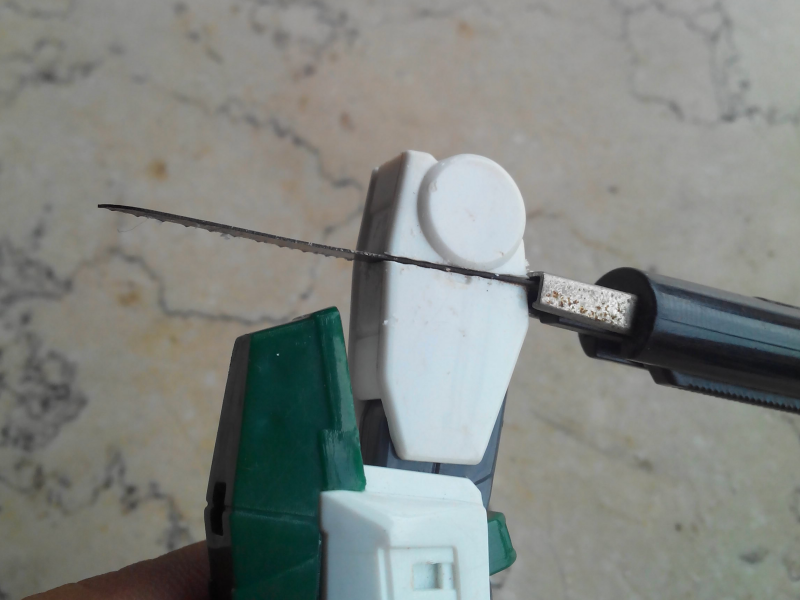 Since the insides of the gunpla forearm is hollowed out, the pegs that connect both halves are gone. Join them using super glue, but don't forget to return the hand polycap inside. 4. 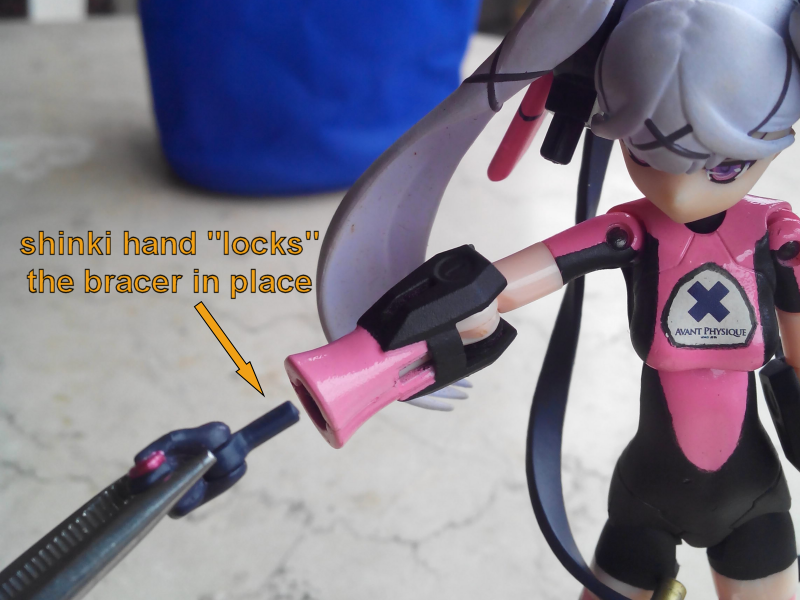 After the glue has completely dried, try out the bracer by sliding it over the shinki's forearm, then secure it by inserting the shinki's hand through the polycap and through the shinki's wrist hole. The bracer type is good for when you want a "light armored" look for your shinki. And since you're already using the shinki's hand peg as a "lock" for the bracer, the use of gunpla hands is out of the question (unless the gunpla hand's ball-end wrist joint is replaced with a long thin peg similar to a shinki's hand's wrist peg). Nice set of tutorials. I'd do some more of this were I not at a shortage of Shinki bodies (my fix with RAcaseals is a little more involved). Personal experience from modding a Delta Kai went mostly like this; I went for the full arm replacement, which, luckily, was almost a straight plug-and-play, though I had to omit the spacer to make the peg long enough. 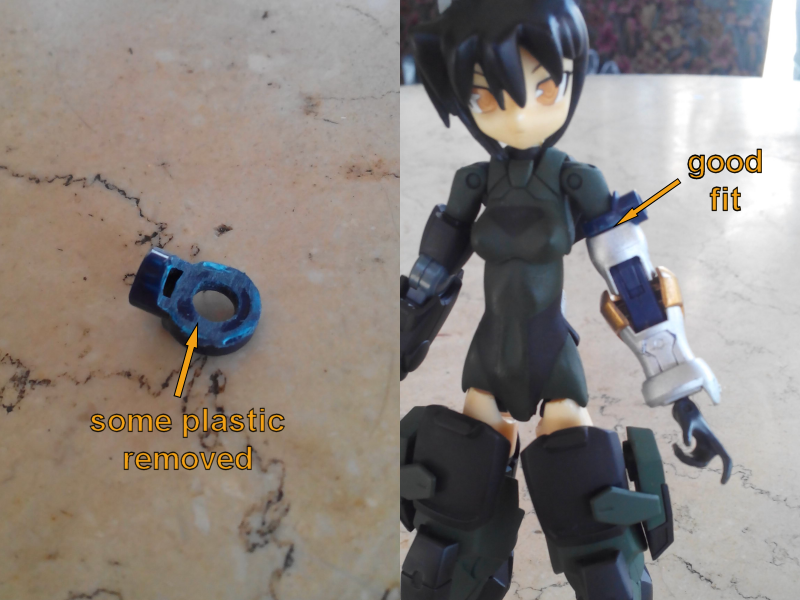 I also wound up finding a piece of plastic tubing the perfect size to act as an adapter between the Gunpla and Shinki hands; outer diameter fits snugly into the ball socket, and inner diameter holds the Shinki hand. Now, on to the leg armor. Unlike modding the gunpla upper arms, there are a few more options that you can do depending on which gunpla you choose and what parts you have on hand. Like the arms, I also made use of two styles: the full leg and the boot type. Again, this is what I use the most, replacing the entire leg with a gunpla leg of your choosing. And to do that, before anything else, let's look at the gunpla thigh design. 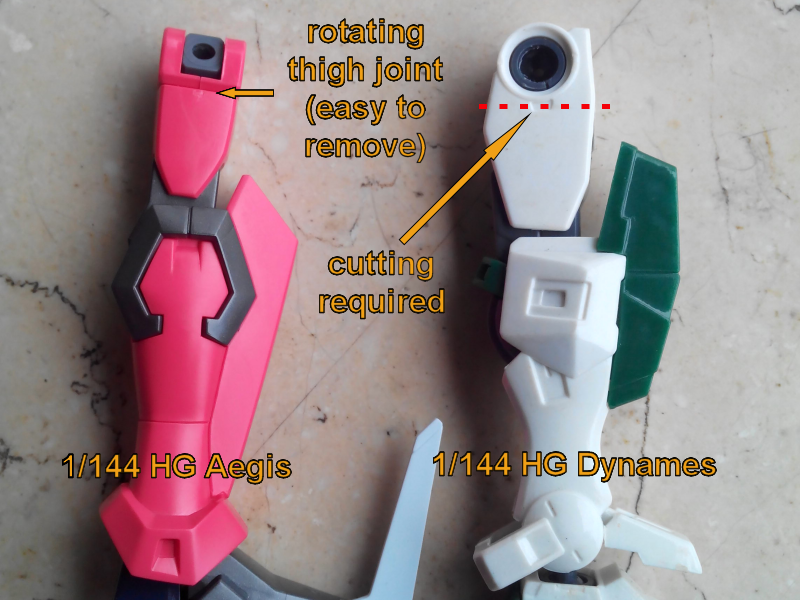 Some gunpla have single thigh units that rely on ball-end joints for movement (i.e. Dynames, Unicorn). If opting to use such gunpla, cutting off the upper part of the thigh is imperative. 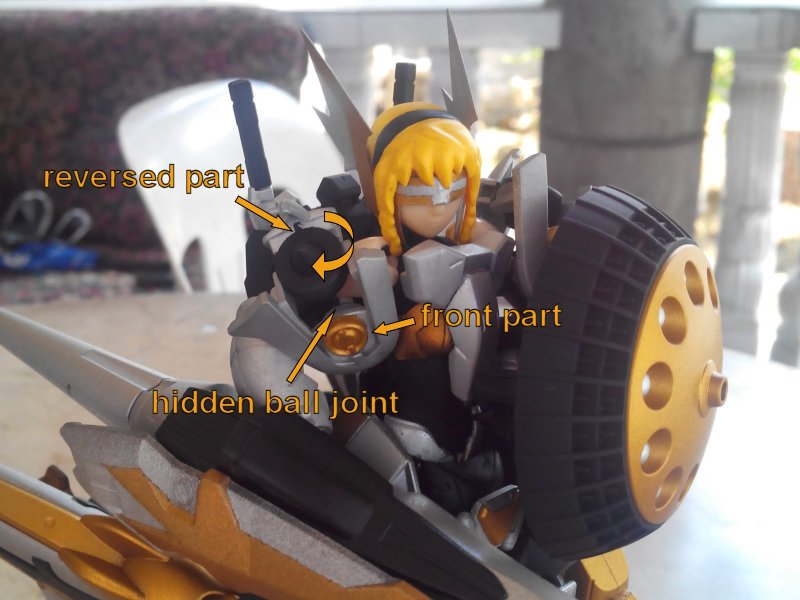 Others, have thigh joints where you can rotate the legs, and are quite similar to shinki thigh parts (i.e. Aegis, Gundam 00). These have little to no need for cutting since all you have to do is pull out the upper thigh part off. 1. 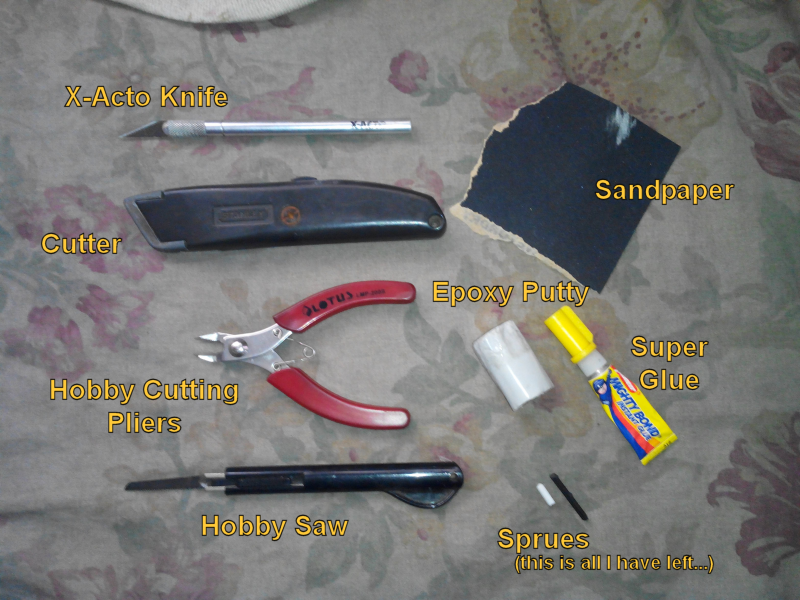 Get your hobby saw or any cutting tool and remove the upper part of the thigh. Be careful not to stain your shinki or parts with your blood. If your chosen part has no need for cutting, skip this step. 2. Clear out the space inside the thigh's shell. The depth of the space must be enough to fit the length of the shinki's thigh peg + spacer (use the shinki thigh spacers for a better look). 3. Fill in the space with epoxy putty, but not too much. 4. 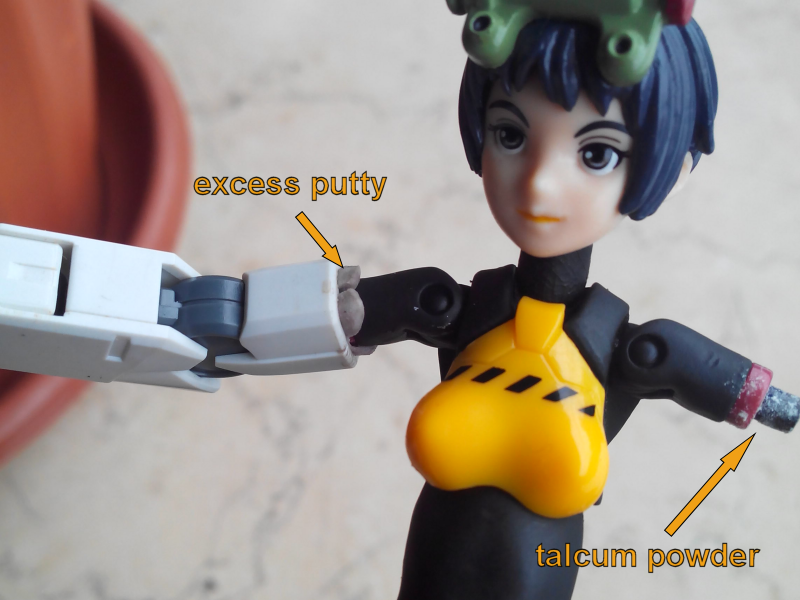 While the putty is still soft, coat a bit of talcum/baby powder (wetting the surface with water also works very well) on and around the shinki thigh peg then carefully sink it into the putty. Make sure that everything is aligned properly. Hold for around a minute or so, then slowly pull them apart (the powder or water should keep the putty from sticking into the shinki peg). 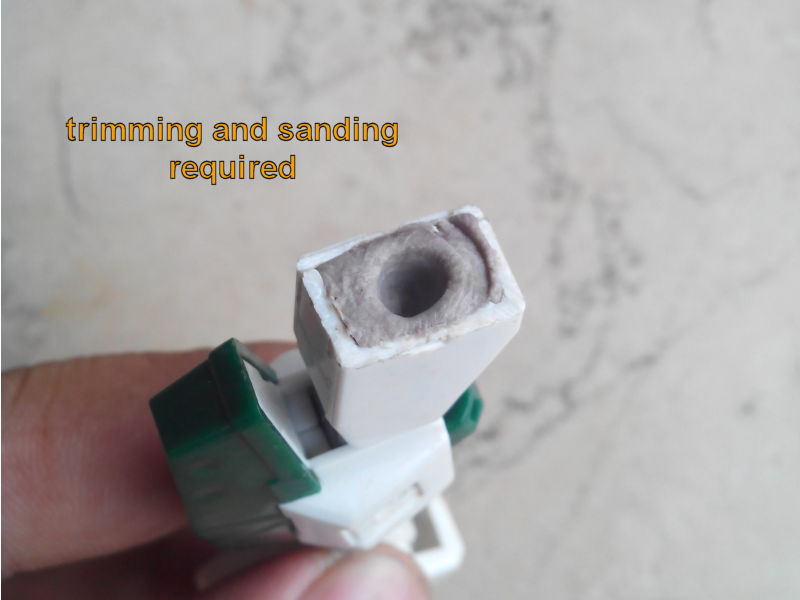 If done properly, there will be a correct-sized hole left in the putty. Wait for it to harden a bit more, then cut away the excess material. 5. After curing, check how the thigh parts fit together. 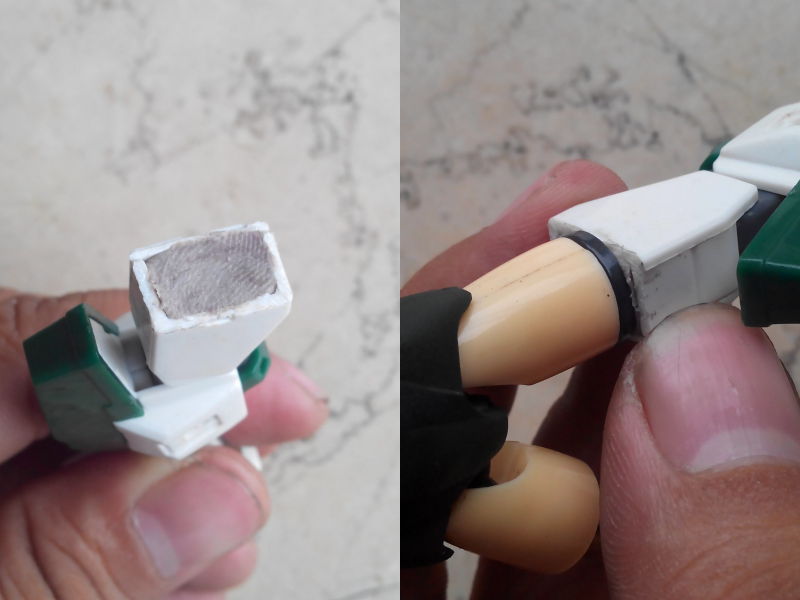 Use the super glue technique of tightening joints if necessary. 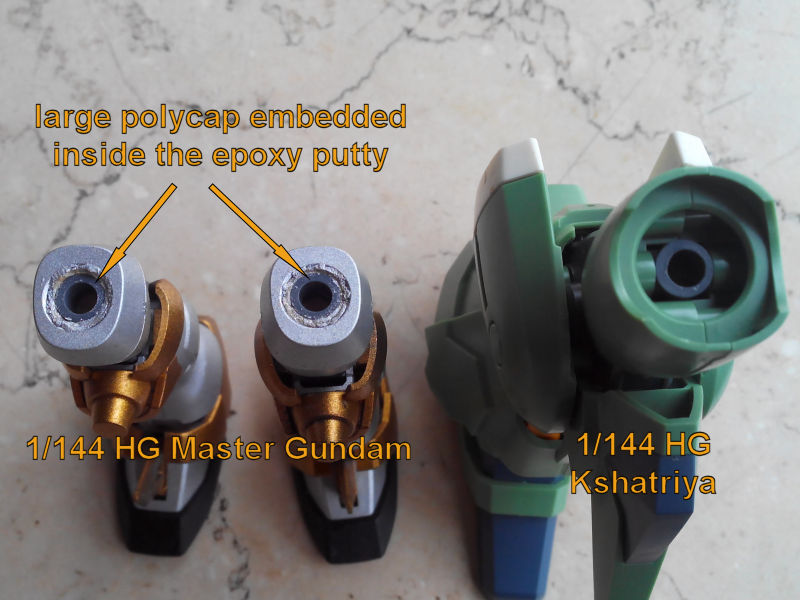 An additional option would be the use of the larger polycaps found with 1/100, MG or the larger HG gunpla. 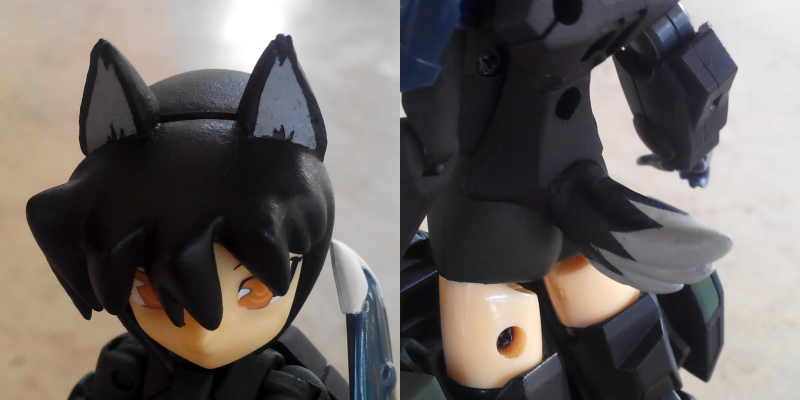 Shinki thigh pegs fit snugly into them, so when available, I embed them into the epoxy putty. The result is an exact fit, a heck of a lot better than just using the holes molded from the epoxy. A bit more difficult to do, but trust me... definitely worth the effort! This modding type is a bit high on the difficulty level as this requires you to do the arm 'bracer' mod on the gunpla lower leg PLUS adding a peg inside to secure the shinki's leg. This should be done if you are quite confident on your modding skills and patient enough to perform this through trial and error. When I did this, it was just started on a whim and finished after a lot of checking, measurements, trials and mistakes. But hey, I'm not stopping you from trying this out. The prerequisite is a gunpla lower leg with enough interior space to slide in the shinki's lower leg through, and a carefully positioned peg inside that fits into the weird hole on the shinki's shin. My Baby Razz, Ayu and my Lancamento, Rui both use boot type leg armors. Ayu, with her smaller frame and a required light armored look, received the lower legs of the Gundam Astray. Rui used the lower legs of Seravee Gundam (need I say, knee cannons? ), so internal space was never an issue. I'll just highlight the steps, and sorry for lack of pics since I won't be doing this mod anymore anyway. I'll just leave it up to your imagination then . 1. Clear out the space inside the lower leg shell. Make sure that the shinki's lower slides through without hindrance. If the pegs that hold it together are removed, don't fret. They'll be fixed later. 2. Get a long piece of plastic stick (preferably from a gunpla runner) that fits into the shinki's shin hole. It must be longer than the end of the shinki's leg. 3. Open the gunpla's lower leg shell. Get one half, and try fitting the shinki leg + plastic stick inside. Then, get the other haft and enclose everything inside, making sure it fits. Remove more inside material or shorten the plastic stick if needed. 4. Now for the tricky part. Put a bit of epoxy putty or super glue on the bottom inside of one half of the gunpla lower leg shell. Fit in again the shinki's lower leg + plastic stick. Make sure only the stick comes into contact with the epoxy or glue, if any gets onto the shinki, you're screwed. Wait for it to dry. 5. Close the gunpla lower leg shell and pull out the shinki's leg. If done properly, the stick will remain inside to serve as the shinki's new shin peg. To be sure, add in more putty on the bottom to further secure the new peg. Glue both halves of the gunpla shell together. Confusing without pictures, right? I only did this once for Ayu's custom legs. In Rui's case, there is a TON of empty space inside the Seravee's lower legs that fitting everything was a total breeze. Oh, I also did this to Rui's old boots made from a Tieren Taozi, but it still had more inside space compared to the Astray. Again, the boot type mod is something I don't recommend, just because of the increased trial and error factor and increased risk to your shinki's parts. I don't really like adding in stuff like shoulder armor because, unlike in gunpla, shinki shoulders don't have easily removable or moddable joints for us to mess with. Also, most times adding shoulder armor will impede freedom of arm movement. However, in some cases like having the need for a heavy-armored look (i.e. Griselda's paladin heavy armor), having shoulder armor is important. But without a usable shoulder joint, the closest that we're going to get to shoulder armor on a shinki is through the upper arm connector. The upper arm connector can be used to equip your shinki with gunpla shoulder armor. If you're not going to replace the whole arm or you're going to use a bracer type armor, the upper arm connector can be used as is. 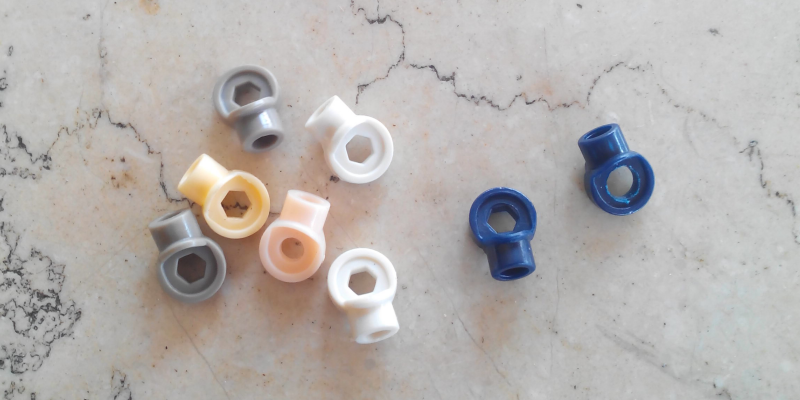 However, when doing a full arm replacement, it is necessary to mod either the shoulder armor, the upper arm connector, or both in order to connect them. 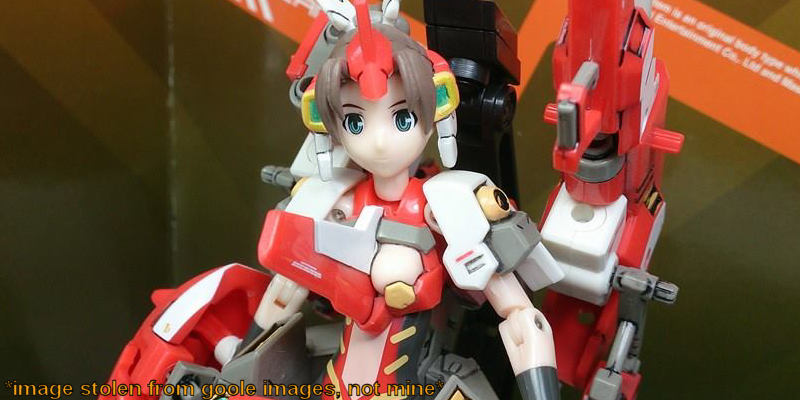 But first, let's look at my one shinki that has a sort of shoulder armor in stock, the Lancamento. Shoulder armor to upper arm connector... this design is simple, but limits arm movement a little too much. However, she is a gunner so large arm movements aren't really necessary in her case. We can make use of pseudo-armor parts to make light equipment on the shoulders, similar to Lancamento. This is the easiest way, and only requires minor modding of the armor parts don't have pegs or if the existing pegs aren't the required size. 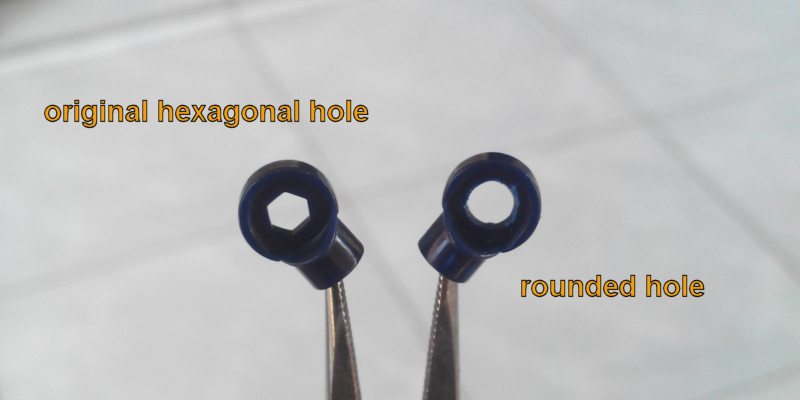 Note that the connector's hole is hexagonal in shape, better to make it round to give it free rotation. Now, for your full shoulder armor mod (and start of the chaos ). Choose your shoulder armor. It should be open on the side, because if it is kinda enclosed, some removal of plastic is required. 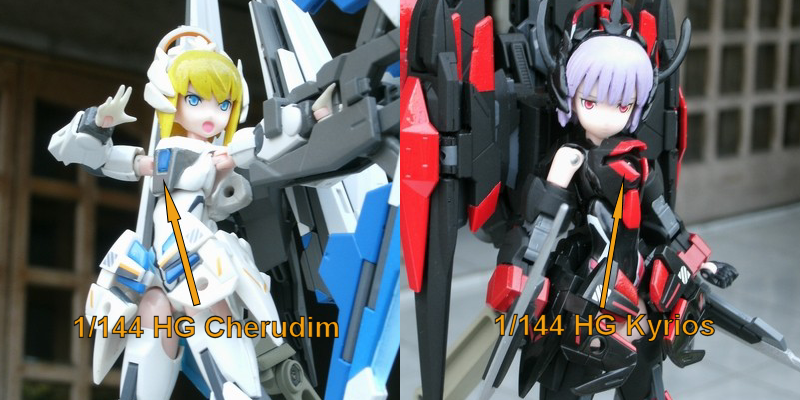 Also check the shoulder armor's height and width, make sure that it has enough free space to fit the shinki's entire shoulder AND upper arm connector. Also, it should not get in the way of the shinki's shoulder blade and back connectors. A lot of requirements, I know, hence the problems of actually using shoulder armor... the shinki body just isn't designed to use it. 1. Choose your gunpla shoulder armor that fits the requirements above. 2. 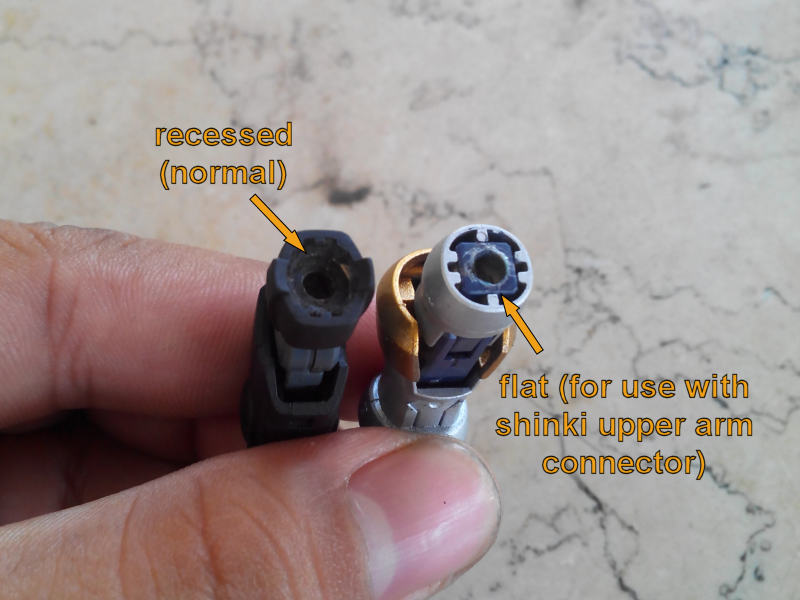 Choose your method of joining the gunpla shoulder armor to the shinki upper arm connector. Just make sure that the way it is connected doesn't hamper movement too much. When I said "choose your method", it means do whatever you feel works for you, i.e. 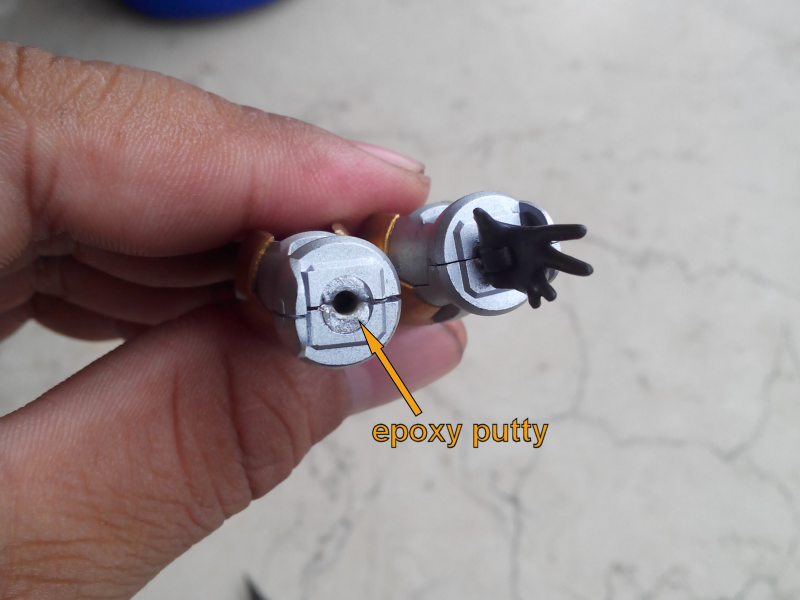 gluing a polycap inside the shoulder armor part and on the shinki's upper arm connector, a peg; or vise-versa; making use of the existing hole to almost fit in the connector itself (though hole enlargement is almost always necessary), etc. 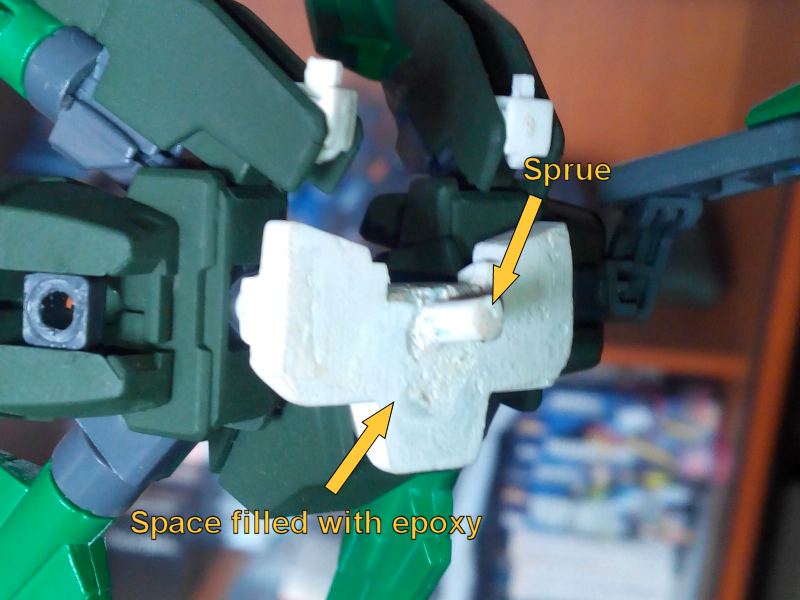 Also don't be limited in using the gunpla shoulder armor's original orientation, sometimes reversing it works better especially if the shoulder armor is a bit too small to connect properly. It's up to you what process to use, as the process varies greatly depending on the gunpla's shoulder armor size and design (you should know this if you've built several different gunpla before). Now, if you're going to do a full arm mod, things can get even more tricky. Since the shape of the upper arm connector is made specifically for use with the shinki's stock arm, it will not fit most gunpla arm replacements. so, simply remove some material so make one side flat, with the amount of material removed depending on the size of the gunpla's upper arm. 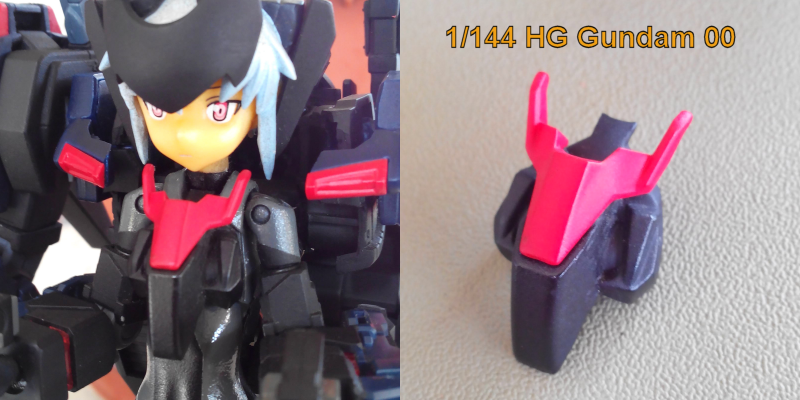 FOr this, the modded gunpla upper arm's surface with the hole should be flat, not recessed. Meaning, you should decide first if your shinki is to use shoulder armor or not, THEN mod the gunpla upper arm accordingly. Make sure that the gunpla upper arm and shoulder armors are a match, because some shoulder armor parts are too narrow for some gunpla upper arm designs (a lot confusing at first, but you'll get it once you start selecting parts for mods). After that, just do the above steps for the shoulder armor attachment. 3. Best to connect upright: Any larger shoulder armor, but will need lots of modding. 4. There is no common, regular or absolute way of doing shoulder armor... what you need to do varies greatly with the shoulder armor parts you choose to mod with. So that's how you do shoulder armor. I wound up attaching 'Rythae's Delta Kai shoulder armor directly to the replacement arms, but that's rather specific to the HGUC Delta series shoulders. For the head mod, select armor pieces and glue them on using epoxy putty, since this molds into the irregular shape of the hairpiece that's almost impossible to get through filing or sanding. Usually, the front hairpiece gets this treatment. In the cases of Kei and Rui, I modded their armored hairpieces, but left the non-armored ones untouched. But in the case of Noire and Laika who both don't have alternate hairpieces (actually Laika, my Howling, has another hairpiece for the helmet but was damaged during modding experimentation), so there's no turning back for them. For Laika, modding in the dog ears was a bit of a challenge since I don't have anything at hand resembling dog ears to use so I had to sculpt them out of epoxy putty. 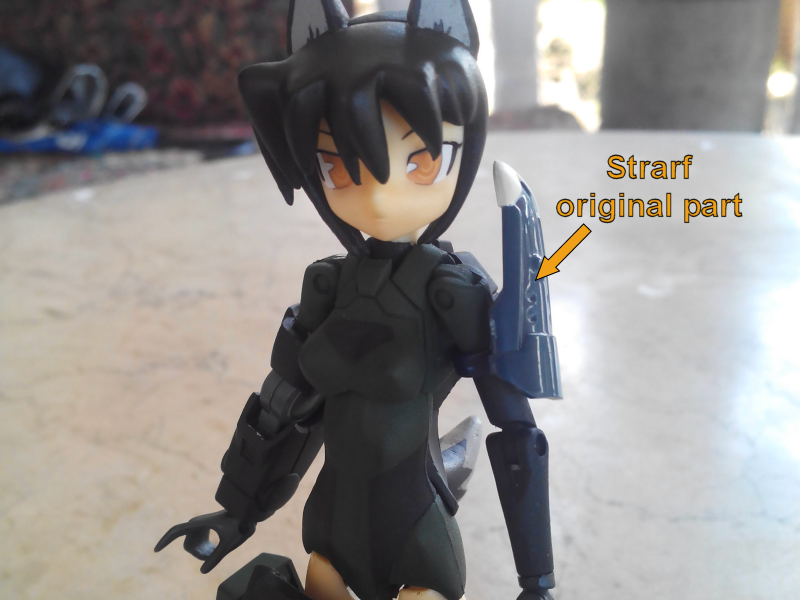 I also added a dog tail to her back connector, also sculpted out of putty. For the chest pieces, I chose some gunpla chest armor/parts and, like in the head mod, used epoxy putty to attach them. Sometimes, selecting some random small pieces and careful arrangement will yield some surprisingly good results, like in Griselda's first centaur form before I swapped her upper body for a Racaseal's. Incidentally, her current chest armor is also from two random pieces, but resulted in a look that works well for her heavy-armored theme. Note that I don't like the MMS3rd's vest-type chest parts but the same procedure can be used on them. 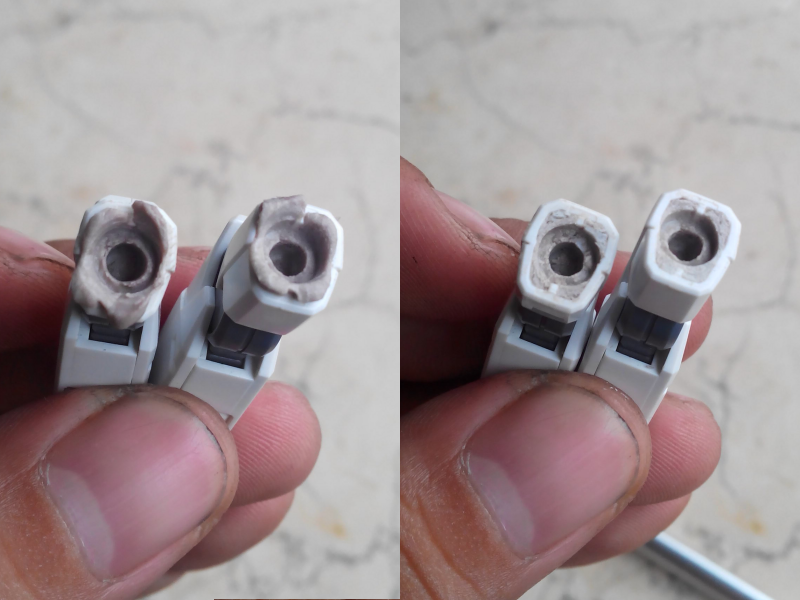 In case you want to do head and chest armor mods but don't like the idea of them being permanent, try doing a connector mod. Drill a hole on the chest piece/hairpiece and a peg on the armor parts so they can be removable, but you'll have to do something for the hole left vacant whenever your shinki isn't wearing her chest/hair armor, like inserting a peg with something that looks like a brooch or jewel or something. You can also try recasting the hairpieces and chest pieces in resin (or epoxy putty) so that you'll have extra pieces to work with. I haven't tried that honestly (I wanted to, really! But I don't have a proper recasting kit...) but should it work for you, you'll have a near unlimited number of extra parts to mess with! That basically sums up the mods that I've done all my few years of shinki collecting. A for painting, I just used my experiences back when I was a gunpla collector. But for those who are new, there are a lot of hobby painting guides out there that you can follow. I've never done a thorough tutorial about anything in my life before, so any addons, suggestions and recommendations are most welcome. Or, if you spotted some errors on the guide, or if you wanted to add some more content, be free to say them so that I might add them into the guide. Again, this is how I did my mods, so feel free to do them YOUR way. If you did things differently or used some methods of you own, feel free to post your pics here so that I can learn a thing or two from you. Anyways, Thanks for reading through all my stuff! Lots of useful tips on this one. I do think you could probably make non-permanent Shinki head mods via the use of pinning, but that'll leave holes when the armor isn't in place. Well, this might not work as well for heads, but it should be plenty doable to create blank Shinki chests via 3D printing and use them to mount armor pieces on (I know MMS Nakeds came with something of the sort). I know there are a few members who are working on 3D printing various Shinki parts; it might be worth it to ask them. Heads might be harder, though I know some Shinki come with head parts that have removable armor parts (Eukrante or Raptias both come to mind) that could be used.